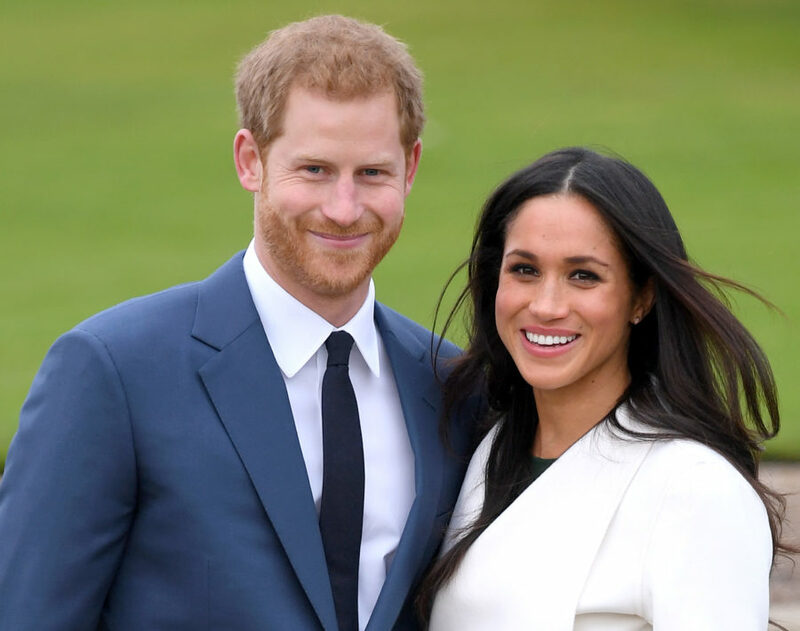 The cake that will be served at Prince Harry and Meghan Markle’s upcoming wedding on May 19 is bound to be gorgeous. The couple chose pastry chef Claire Ptak to create a lemon elderflower cake for their big day, and on May 15th, Ptak posted a photo of crates of Sicilian lemons being delivered with the caption “and so it begins.” If Meghan’s chic style and love of food are any indication, the dessert will certainly be on-trend and modern with a subtle nod to tradition. First, it’s all about the flavor. 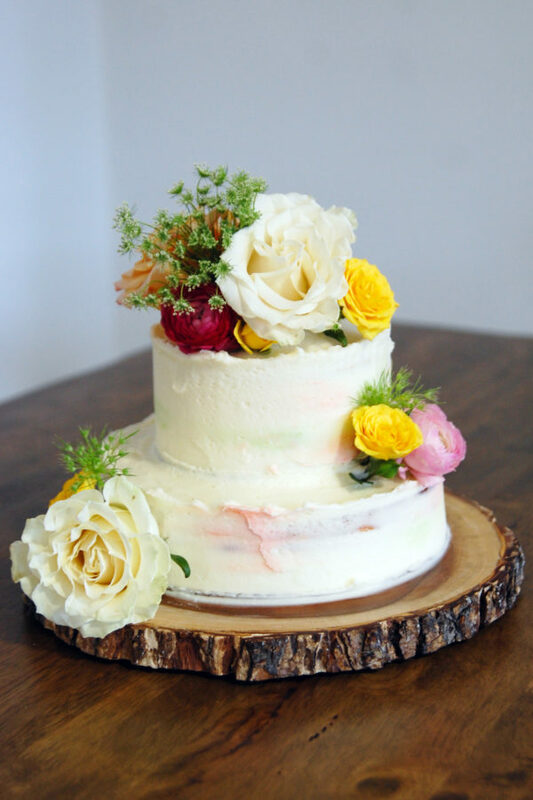 Ptak — who was raised in California like Meghan — “focuses on using seasonal and organic ingredients,” so she no doubt will be using fresh elderflowers in her cake recipe. Unfortunately the tiny, creamy white blooms, which come from elderberries, are not easy to pick up in New York City during a crazy spring snowstorm, so I had to compromise and use elderflower liqueur (in this case St. Germain) to infuse my cake with the blossom flavor. I started with a lemon curd cake base, adapted from this recipe from My Recipes. But instead of layering the cakes with curd as called for in the recipe, I used a mixture of elderflower liqueur, sugar, and lemon juice and brushed it on top of both cake layers so the liquid would lightly soak through the sponge. Next up is the icing. If you’ve spent as much time deep-diving into Ptak’s Violet Bakery Cafe’s Instagram account as me, you’d know that the pastry chef uses a not-so-perfect approach for frosting the outside of her dessert — it’s the Meghan-messy-bun-look of cakes, if you will. The icing is swirled on in a thoughtful but rustic way, nothing too polished or smooth. 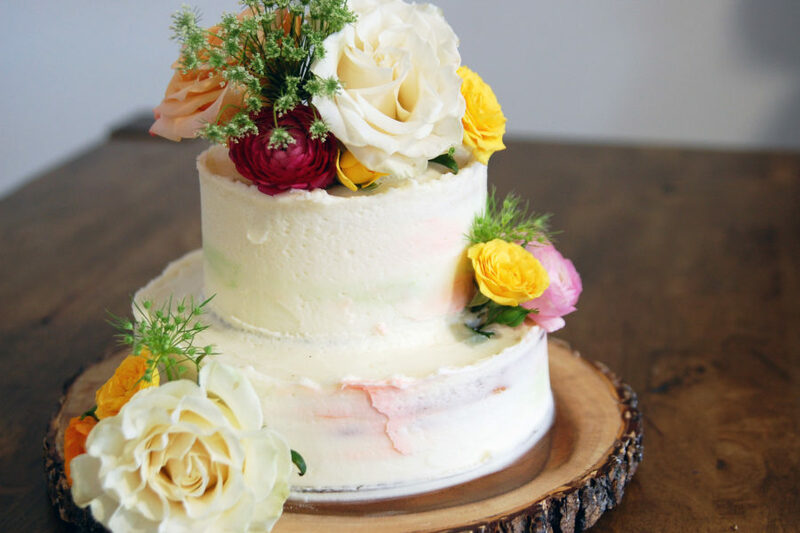 Also, she rarely decorates her wedding cakes with white buttercream. But this being the royal wedding, I stuck with traditional wedding white and added a watercolor effect in bright spring colors. It’s finally on to the decorations. I had to be strategic when picking out fresh flowers to top the cake. My baker’s intuition tells me that Ptak will opt to use peonies — which will be perfectly in season in time for the nuptials, but were not an option at my local florist today (please see snowstorm above). So I picked up some garden roses and ranunculus, which evoked the look of peonies to me (look, there’s about a foot of snow on the ground so I did what I could), and added Queen Anne’s lace — the little white and green buds — because I liked the cheeky royal tie-in. So, what was my verdict? *lets out heavy sigh of relief* Making a wedding cake — whether it’s only two tiers or a whopping eight tiers (like Prince William and Princess Kate’s colossal confection showstopper) — is hard work. Yes, it took me seven hours to bake, cool, frost and decorate the cake from start to finish but the end result was more than worth the effort. Plus, I think the modern-meets-classic look with a floral twist is exactly the kind of look Meghan would like (ahem, she followed me on Instagram so we’re basically best friends). And, by the way, the cake tasted fantastic. The lemon and elderflower come together perfectly. I daresay, it’s almost like taking a bite right out of spring. Read below for my full recipe if you’re inclined to make the dessert yourself—and, while you’re at it, toast the royal couple with this delicious elderflower lemonade cocktail.